Two weeks ago Rupert Murdoch said Donald Trump was embarrassing "the whole country." But now the two Republican party power brokers may be brokering peace. The two men recently spoke for the first time since Trump entered the presidential race back in June, according to people with direct knowledge of the call. It was just a phone conversation, not an in-person meeting, but it was cordial and forward-looking, the people said. One person described it as a peace making effort. The call took place about a week ago. Why does it matter? Because Trump has become the Republican presidential front-runner and a political force to be reckoned with, despite eye-rolling from establishment figures like Murdoch. And because Murdoch wields great influence in conservative circles. As the patriarch of the companies that own the Fox News Channel, the Wall Street Journal, and the New York Post, Murdoch lets his political opinions be known through editorials and tweets. Murdoch sniffed at Trump in July, tweeting on the 12th that Trump's rhetoric about threats posed by immigrants was simply "wrong." "Mexican immigrants, as with all immigrants, have much lower crime rates than native born," he wrote. On the 18th, after Trump questioned John McCain's war hero status, Murdoch went even further, tweeting this: "When is Donald Trump going to stop embarrassing his friends, let alone the whole country?" The New York Times reported on its front page about "public warfare" between the two titans. The story noted that the New York Post had been slamming the candidate, declaring that "Trump is toast" on the front page after the McCain dust-up, and that the Wall Street Journal's editorial page had called Trump a "catastrophe." 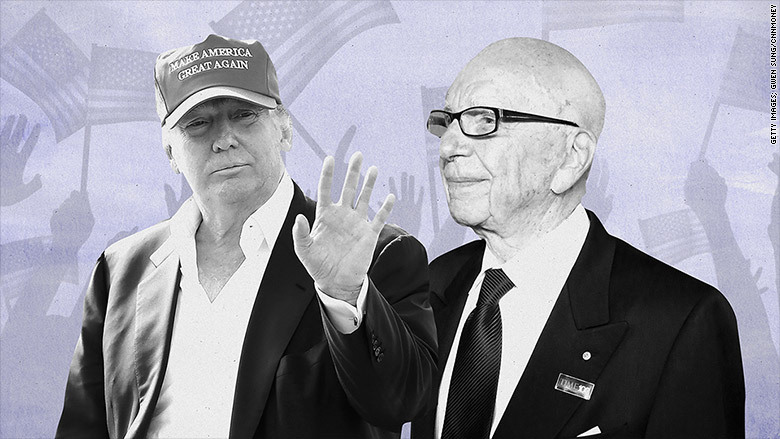 Murdoch and Trump have since connected privately and exchanged pleasantries by phone, according to the people who spoke on condition of anonymity for this story; Murdoch tried to mend fences by expressing respect for Trump's business acumen. Trump had nice things to say, too. Previously, in his 2008 book "Think Big," Trump credited Murdoch for buying Wall Street Journal: "He always wanted it and he knew he would get it. Rupert is a true genius." Representatives for the two men declined to comment on Tuesday. "If Trump gets thru unscathed it will be big win. Time for all to understand his support."